Square Enix has announced that Final Fantasy 15 has gone gold – i.e. been finished – ahead of its release at the end of next month. To celebrate, the Japanese publisher has unleashed a new, four-and-a-half-minute CGI trailer called 'Omen'. It's made in conjunction with Digic Pictures, who worked on Kingsglaive: Final Fantasy 15. Fresh DLC details have also been released. We're getting a $24.99 season pass containing three original episodes based on events of the main game: Episode Gladiolus, Episode Ignis, and Episode Prompto. Each ep places you in the shoes of that single character for its duration. Following those releases (and two 'holiday packs'), a new online co-op mode is coming called Comrades, in which you can control those three characters, plus main man Noctis, as a group. That's available separately from the season pass, should you so wish. 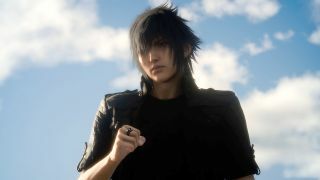 Final Fantasy 15 is released on PS4 and Xbox One worldwide on November 29.